So you've dropped your iPhone 4 and shattered the screen, or you've accidentally submerged it in liquid, and you go to have it repaired. You have the screen replaced and/or the battery, and you find out that the phone turns on but has no brightness on the screen. You've just entered the "No-Backlight Twilight Zone!" Here's the deal... when you shatter the dispay, there's a chance that you can damage the component that controls screen brightness and the backlight when you get it put back together. Having water damage is an even greater cause for burning out the screen's brightness function. Either way, there's only one way to fix that problem, and it involves replacing chips on the IC board (integrated ciruiut board). There are two compnents that control the backlighting on your iPhone. They are the Backlight IC chip, and the Backlight Coil (see diagram). The backlight IC chis is about the size of a large grain of rice, and the coil is a miniature Cheerio that isn't much bigger. Usually, it's just the backlight coil that is out and needing replacement. But sometimes, the backlight IC chip can also sustain damage and need replacement. Replacing these two components involves desoldering. You can't use a regular soldering iron, either. You've got to have one with temperature control, preferably one that uses hot air. If you heat up the IC board beyond what it can withstand, you'll ruin it. A damaged IC board = buying a new phone. There are lots of people selling replacement backlight IC chips and backlight coils on eBay and Amazon, and there are a few discussions going on at www.ifixit.com on this topic. But I have yet to find one single video or guide that shows a technitian successfully performing this repair. This might be due to the difficulty of the repair. Either there aren't many people out there who can do this because it is harder than what is described by the parts sellers, or the few people who can actually do this are protecting their market by not sharing any information on how they have accomplished this. 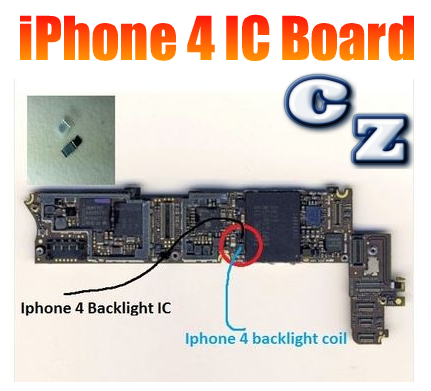 If you have come across a video showing the replacement of the backlight coil and IC chip, share it on this thread. I would love to see this actually being done. As of the time of this article, I have not found a single after-market Apple/iPhone repair shop that offers backlight coil replacement in the State of Missouri. Knowing how common this problem is, I'm thinking someone could corner the market and make quite a bit of steady income if they figure this out. This just reinforces my less-than-positive view of the iPhone 4 construction. It's an ultra-fragile device that is prone to breaking, and the burned-out backlight issue seems to run rampant. Maybe we will see some type of improvement on the iPhone 5 that will guard against these issues. Are you an expert with the backlight coil replacement process? Please chime in!